This is an unusual ancient Roman intaglio, dating to the 1st century A.D. 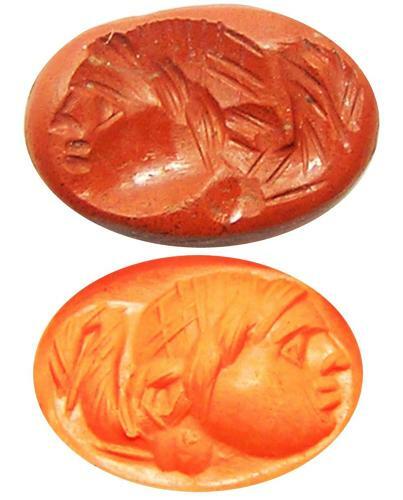 It is nicely cut on a red jasper gemstone, with an image of a female head. The gem is reminiscent of a Gryllos, a magical gem engraved with a three-headed monster. This example appears to show a female head with long flowing hair, to me, it feels 'disembodied' or perhaps representing a ghost/spirit. This gem would have originally been set, into a gold or silver signet ring, used to seal and authenticate letters and transactions. Today this ancient gem has survived down to us in perfect condition, suitable for remounting or to add to your collection.